If you find yourself in the beautiful Champlain Valley, stop by our Ferrisburgh store in Vermont where there is so much to see, learn and, most important, taste! What to see in Our Sugarhouse: Our Sugarhouse has been used to boil sap every season for over 58 years! Inside the Sugarhouse, you will see a 3” x 10” King Style Maple Syrup Evaporator, which is used to boil the sweet sap from local Hardwood Sugar Maple trees into Maple Syrup, and a Springtech Reverse Osmosis Unit, which boils sap more efficiently – on display! View a short video about the history of Maple Syrup and a rotation of photos which capture the art of maple syrup making, from collecting the sap to boiling it down in sugar shacks, deep in the Maple Sugar Groves of Vermont. See this all, plus a display of the various tools used to collect sap dating back to the late 1800's! What to see (and taste!) 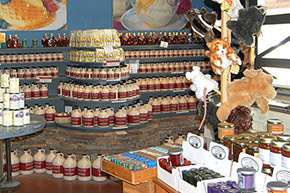 in the store: In the same building, you can visit our 6,000 square foot retail store, where you can always enjoy samples of our own Summer Sausage, Smoked Pepperoni, Smoked Meats, Homemade Fudge and a range of jams, jellies, chutneys, butters and dips! We’ve also hand selected some of the best Vermont-made products and proudly sell them in our store – from Goat’s Milk to Clothing to Lotions and Kitchenware – you’re sure to find a piece of Vermont to take home with you. 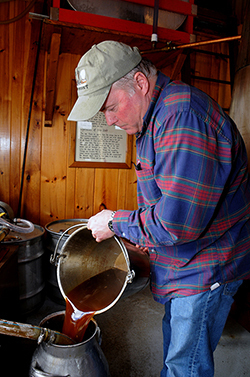 Browse all grades of Pure Vermont Maple Syrup, and while you do, learn more viewing a short educational video about the making of Pure Vermont Maple Syrup – from tree to table! 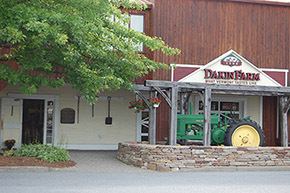 New for this year; stop by our air-conditioned theatre and view our newly filmed Dakin Farm Story! Located on the far-right side of Dakin Farm’s retail store, just follow the maple leaves and head through the door into the theatre. Have a seat and enjoy! The video is approximately 9 minutes long and tells the story of Dakin Farm’s century old traditions, proud heritage, and history. Larry the Cable Guy: No, the real Larry the Cable Guy isn’t here, but he was! 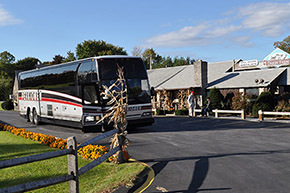 Even better, he featured Dakin Farm on his show “Made in America” and trust us, it is hilarious! View it next to our meat room and Smokehouse, where you’ll see slabs of bacon and hams coming out of the Smoker – the scent is divine! Our Master Smoker, Bob, has been spiral-slicing our maple-glazed hams for over 20 years. Some days, you’ll get to see him perform his craft – glazing the hams, then spiral-slicing them to perfection.